The concept of free online roulette games might sound counter-intuitive. When you sign up for a Canadian online casino in 2019, the plan is to win money playing online roulette, so why bother with games without a cash prize? Well, in fact there are plenty of reasons why players in Canada's online roulette community might prefer to try their hand at free games before progressing to real money play, or even play for free while they have money in their account. Some of them just might not have occurred to you yet. The people who run online casinos for Canadian players are very creative, and they are coming up with new online casino games all the time. Even in 2019, Canuck sites will occasionally begin offering a new variant of online roulette which wasn't available before. Games such as Spingo and Multi-ball Roulette are products of the internet age, and sometimes you won't want to dive straight into real money play before properly getting to grips with the game. Playing for free helps you understand these new variants and appreciate what is needed to win. There are dozens of different online roulette strategies and systems floating around the internet, maybe even more than that. Some of them can prove profitable to players with patience and a commitment to a good strategy, but others might be speculative or flawed and end up losing you money. Playing for free allows you to test out these different approaches without running the risk of losing big on a system which the creator hasn't properly thought through. You may miss out on winnings in the short term, but if free play convinces you of the value of a new system or strategy then there will still be money to be won when you use it for real money play. Playing online roulette for real money can take its emotional toll now and again. Because of the luck element, the swings can be high and a long run of good luck can be balanced out by losing spin after losing spin. That's just how luck-based games work. 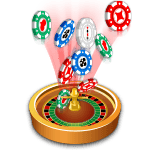 If you started out playing roulette online because you found the game to be fun and, you don't want huge financial swings to take away that enjoyable element. Sometimes it can benefit you to take a break but still enjoy the graphics and excitement of free games without that added pressure. Just because most free online roulette games are just for fun doesn't mean that some don't also offer real prizes. Indeed some of the time you can give yourself a shot at winning something at the end without risking a single cent. Also, some casino websites will also offer freeroll tournaments for roulette and/or other casino games. These are free-to-enter tournaments with real cash prizes. It might surprise you, but even the most experienced online roulette experts like to kick back and play free online casino games once in a while. Our team here at Roulette.ca has years of online roulette experience, and that includes free games as well as real money roulette across a wide range of stakes and plenty of different variants of the game. Our reviewers have identified the best Canadian sites for free and real money online roulette games, to make sure players, whether absolute beginners or players just looking for somewhere new to check out the games, have the best possible options when it comes to playing this great game across all platforms and devices.